Your sugar glider’s diet should contain a variety of fresh fruit and vegetables and about 1/4 of its food should have protein. 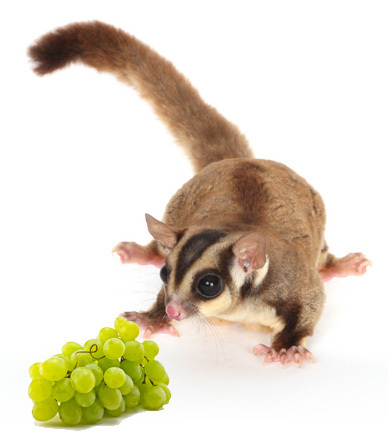 Gliders tend to prefer fruits and vegetables that have a sweet taste. Gliders should not be fed raw sugar, sugar substitutes, candy and never give your glider chocolate. If possible, all fruits and vegetables fed to your glider should be fresh and not canned. Below are some of the items you could feed your pet. Fruits and vegetables you could feed your sugar glider are apples, avocados, bananas, cantaloupe, carrots, sweet corn, figs, grapes, grapefruit, mangoes, oranges, peaches, pears, pineapples, sweet potatoes, and many others. Small pieces of cooked lean cuts of meat or poultry without any additional spices or sauces are good sources of protein. Hard boiled eggs, yogurt, cottage cheese, and tofu are also other protein options. Dry cat food and dog food can be used as a source of protein but should be used sparingly. These foods are not designed for sugar gliders and may not fill the nutritional needs of your pet. Sugar Gliders love live insects. Crickets, mealworms, and earthworms are easily attainable insects. Don’t feed your glider insects that have been collected outside where they may have been contaminated with pesticides. Although great sources of protein, insects should only be used as treats due to their high fat content. Nuts are extremely popular treats with sugar gliders. The nuts should be raw and unsalted and be given out sparingly. Although loved by gliders, nuts are high in fat. Sugar gliders can sometimes be picky eaters. Even with a well balanced diet your pet may be lacking in important vitamins and minerals. Reptile multivitamin and calcium with D3 supplements can help make sure you have a happy healthy pet. Even though sugar gliders aren’t reptiles, the reptile supplements are convenient, affordable, and supply the needed dietary vitamins and minerals. Even though sugar gliders drink very little and get most of their water from food, fresh water should always be available for your pet. A stoppered water bottle is a great way to keep water available.